FasteCash Pay4Me is an online payment service for those that don’t have access to personal credit/debit card but need to make some online purchase or payment. It is also available for those that have credit/debit cards that are not being accepted by some online merchants. The service likewise provides solution for those that need to buy products or pay for services with other online payment system like PayPal, Payza, 2Checkout, Digital Rivers, Worldpay etc. As you know, some of these online payment systems do not accept payment from Nigeria. Some merchants will not also accept Nigerian issued credit/debit card and that is where FasteCash Pay4Me service comes in to help you out. We have been assisting a lot of our users to make payment online with credit/debit card and with other online payment systems that hardly permit other Nationalities like Nigerians to use their service. This has been our core for some years now. We have helped several people purchase digital products/services online with FasteCash Pay4Me. One of the major digital marketplaces online is Clickbank. We have assisted quite some number of people to make payment of the site. We also help our users to pay merchants that accept PayPal as the only payment option. If your interest is to buy digital products from any site like Paydotcom, Tradebit, eBay, Amazon, Barnes and Noble, etc, FasteCash Pay4Me is your readily available paying pal. There are some merchants that require you to pay on monthly basis for their services. They may provide you membership area for the service and you wish to pay regularly to avoid the service disruption. We presently handle few of such recurring billings. The only condition for this is that the merchant must accept PayPal as the payment option for the recurring billing. We presently don’t provide recurring billing service for merchant that don’t accept PayPal because it is easier for us to manage recurring billing service with PayPal than any other payment method. We have included processing of physical products with FasteCash Pay4Me service. This includes educational materials, CD/DVDs, laptop, ipad, iphone, mini-electronics, and books. Please note that we do not handle payment for heavy goods like car or other type of automobile and products that require container for shipping and needs duty clearance. Please note that we will not process any illegal or contraband product or goods. We may not process any purchase of heavy electronic device. We may also decline to process Pay4Me service that requires shipping of more than two electronic products per time. In case the merchant does not ship directly to Nigeria, we can help you ship the product through our US or UK addressess, depending on the location of the merchant. You will only take care of the shipping fee. At the receipt of the product, the user can collect it at our official delegated location or it can be locally shipped to the user’s address within the country. You need a FasteCash account to be able to use FasteCash Pay4Me service. It is free to open FasteCash Normal account and you don’t need to upgrade your account to FasteCash Classic account, to use the Pay4Me service. 1. Open a FasteCash account if you don’t have one yet. Click the link here to open FasteCash account. 2. Fund your FasteCash account with the amount you need to order for your product or service. (Please, check the Pay4Me page of your FasteCash account to know our present Pay4Me exchange rate with dollar.). Click here to know how to fund your FasteCash account. 3. Login to your FasteCash account, move your mouse over the Pay4Me menu link at the left side of the page, then, click on Order for Product/Service. 5. Where you have the Item, enter the product you want to buy. Let us say the name of the product is Internet marketing software, you will enter it there. 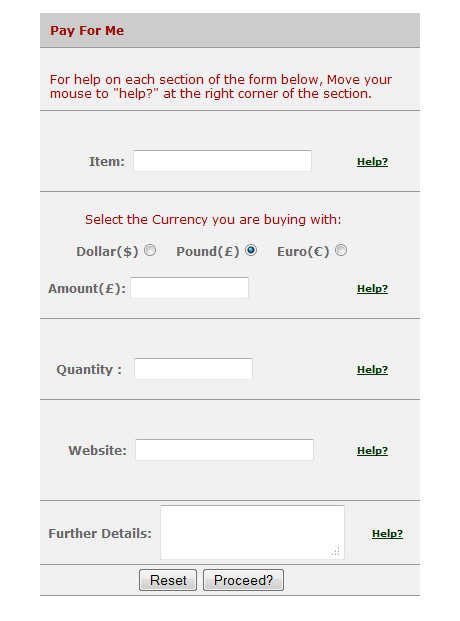 Where you have Select the Currency you are buying with, click the radio button of the currency you are buying with and enter the amount of the product as it is indicated on the merchant website in the Amount text box. Enter the number of the product you are ordering for at the Quality field, then enter the website of the merchant at the Website field. If you have any other information you will like us to know as per the order, like login details etc, enter it at the Further Details field. 6. Click Proceed button to move to the next page. 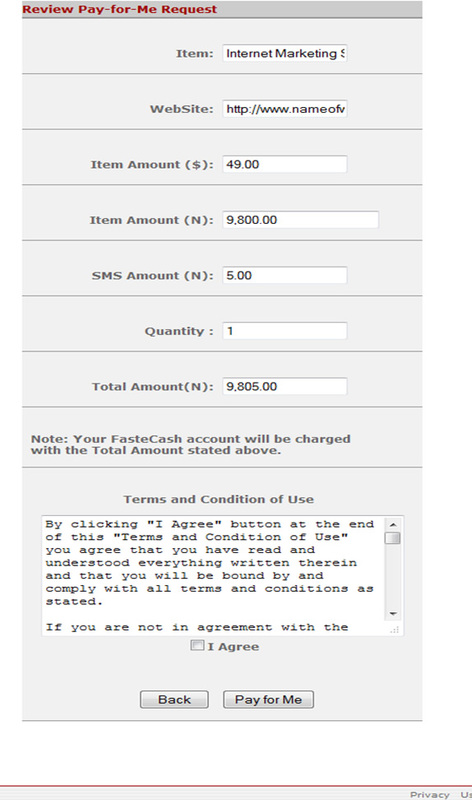 You will see the Review Pay-for-Me Request form showing you the amount you are to pay in Naira. The system converts the money from dollar to Naira value. See the sample image below. Also note that N5.00 will be deducted as SMS fee. 7. Click the I Agree check box and Pay for Me button to finalise the order request. 8. We will then go online and buy the product on your behalf. After the completion of the order, the order details or product will then be forwarded to you if it is a digital product This will likely be within 24 to 72 hours. For physical product, we will inform you about the shipping details and contact you with other necessary information. Physical product order is completed after the product has been received at our office.